Microweber CMS operates on a Modular Architecture. By this we mean something very simple, yet powerful: this software offers users both the opportunity to extend their website’s capabilities and the tools to do that. The CMS has many additional features aside plain text which is dubbed modules. 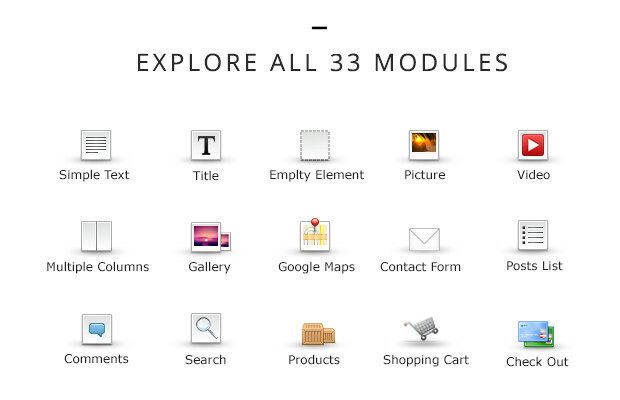 Modules are very diverse and range from Picture Galleries to Contact Forms or Google Maps for example. Modules are the tools you will utilize on your way to creating the website you wish to see. Currently, Microweber has over 30 modules and all of them can be used in Live Edit mode. You are ready to combine and create your content fully “live” without any restrictions. There are different modules for the various needs you have: a Picture Gallery module and a Video embedding module for bloggers, a Checkout module and a Shopping Cart module for online entrepreneurs, Contact Form, Comments or Google Maps modules for socialization. These are only examples so be sure to explore all of them and combine them depending on the purpose of your website and your personal preferences. Microweber also has Layouts. They are very useful if you want to arrange your content in a perfect look. Just drag and drop them and change the text to see their power. You can also add videos, images, text and more. 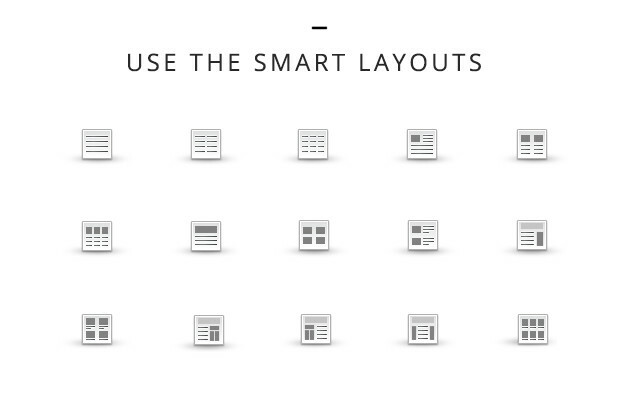 Layouts are basically a set arrangement of content. They are accessible in Live Edit view and their only purpose is to save you time and offer you some preset ways of displaying your content. As with modules, layouts differ depending on the personal preferences and needs of the user. There are text-only layouts, layouts that combine text and image, and more complicated layouts consisting of more elements. Want to set up an employee page of your company? No need to waste time to set all elements of the page – there’s a Team member layout waiting for you to fill with information. Have a breaking news story to share? Use the widescreen image followed by a single column of text below layout. are built-in so you can concentrate entirely on your content’s quality. Just drag and drop a layout across the screen and you’re ready to go.